Chris kicks off the new year with a look back at mid-December release Space Hulk: Deathwing, a dark collaboration between Streum On Studio and Cyanide. 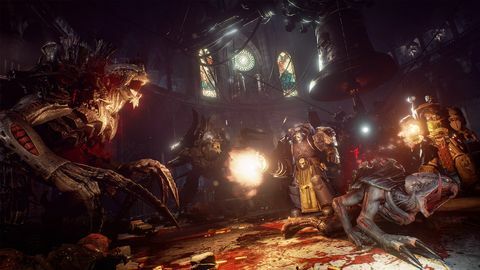 As the seemingly interminable tsunami of Warhammer 40K titles continues to wash over the gaming landscape, virtually drowning gamers in an unending mediocre titles, along comes Space Hulk: Deathwing riding the wave. Is it just more detritus sitting just below the surface, or a buoyant success rising above the muddy backwash? Well, it does float, but that’s not always a good thing. 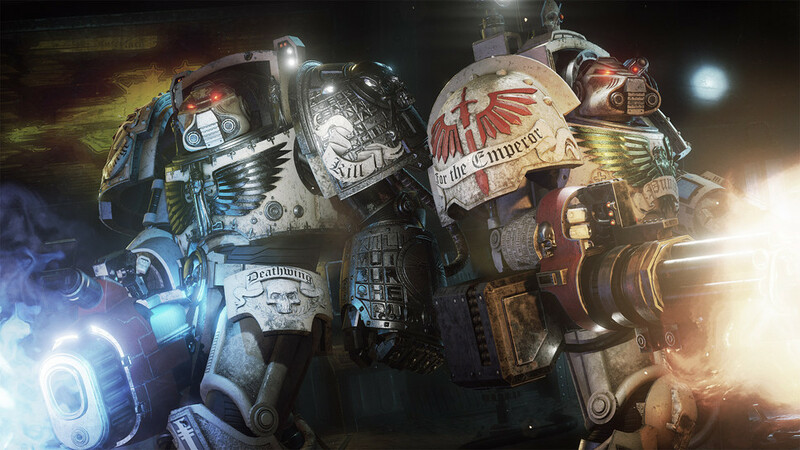 Deathwing is an attempt to bring the turn-based Space Hulk game to the squad-based tactical shooter genre, and in many ways, it succeeds. The confined quarters and corridor dominated levels almost perfectly reflect not only the grimdark aesthetic of the 40K universe, but also respects the tactical and deliberate pacing of the Space Hulk board game and its various turn-based video game adaptations. It’s also the only game to really nail the feeling of being a 40K Terminator or Paladin. From the weighty heft of melee weapons to the concussive blasts of the various oversized guns, this is what wearing power armor should feel like. Even the slower deck-pounding pace of your character feels right. 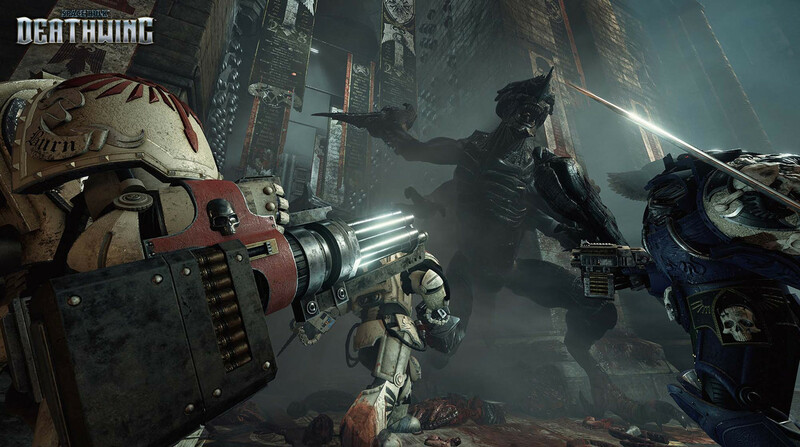 Deathwing is based around a very simple and focused premise: you are an advanced elite unit of three Space Marines seeking the center of a mammoth Space Hulk, eviscerating all resistance you encounter with oversized weapons and devastating Psi-powers. Every level has a set objective that must be completed – usually securing a certain point of the map. Along the way, you will likely be tasked with additional objectives, from investigating what has become of a missing squad to identifying an unknown disturbance. Each of these objectives is essentially a "go to point A" mission, and therein lies the major issue with the game: most of its missions are boring. Not only that, it very quickly it becomes apparent that every level and mission is going to follow the same formula: Arrive. Get mission. Something unexpected happens. Get second objective. Hold ground and kill a whole lot of Tyranids. Compounding this is the level design. 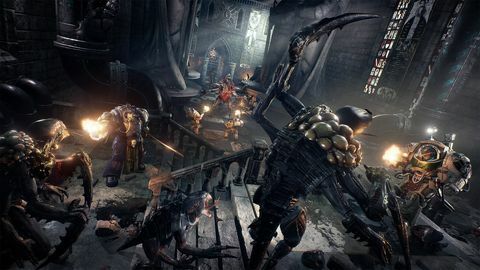 As the whole game is essentially a corridor shooter, the dev team needed to ensure there was not only variety, but also points of interest in every level. Sadly, this is rarely the case. There will almost always be an open area that serves as an arena of sorts on most levels, and while these can be a lot of fun, they blatantly signal where your upcoming combat zones will be whenever you open up the map. Otherwise, levels are a linear trudge through narrow corridor after tedious hallway, and many require a fair amount of backtracking. The whole endeavor would be a lot less execrable if a lot more effort had been put in to designing the missions, as most of other components of the game are well-executed. It’s a shame the actual construction of the levels ruins most of the wonderful art and sound design. Combat is simple and repetitive, but it’s also visceral and extremely satisfying. 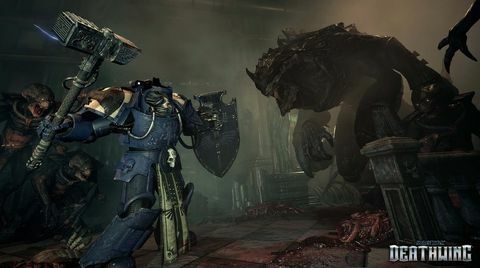 Face-punching a mutant hybrid with a powerfist, or pumping bolter rounds into waves of genestealers never really loses its gib-spattered charm. Your AI squad mates may be next to brainless, but they serve well enough to thin the herd or heal your wounds once the slaughter is over and you need to wash some alien innards from your gore-caked armor. You don't need to rely solely on the AI if you have a few friends who you'd like to bring along to kill some creeps, though. In theory, co-op multiplayer should be a great addition to the game, but it instead feels tacked on, as the campaign does not allow co-op play at all. Rather, you and your human comrades tackle each level as a standalone experience, which kills your ability to carry upgrades or unlocks across levels. This makes co-op feel stilted – a shallow and unsatisfying experience best left alone. At launch, Deathwing was a mess performance-wise. So many times, a frantic battle was ruined by dropped frames or strange stuttering issues, the mouse control was sloppy at times, and the whole thing would crash on a regular basis. However, these issues have since been resolved with a few patches and a hotfix or two, and I was surprised to find that after some additional time with the game, I came away much more satisfied. Dripping with atmosphere, Deathwing nails the look and tone of its inspiration, and perfectly captures everything I ever imagined about how it would feel to walk the decaying decks of a not-quite-abandoned space hulk. However, it is marred by a monochromatic palette, uninspiring level design, boring and repetitive missions, and a handful of smaller annoyances. As with the game's sprawling space hulk, there are some treasures to be found within Deathwing, but it's something of a chore to find them. Space Hulk: Deathwing is a below par title with some excellent art design and satisfying enough combat. Enemy variety is higher than expected, and the unlockable weapons all feel appropriate, but overall it can only really be recommended to 40K diehards. Ups Great art and sound add to the satisfying heft of the combat, and overall tone and feel. Finally, a game that really nails the feeling of wearing power armour. Downs Bland level design. Even blander missions. Repetition begets tedium.